Once upon a time in a pleasant little town in rural upstate New York, a baby was born to an eccentric artist family. She was raised lovingly on artichokes, chocolate cake, honey butter and cerulean blue paint and even before she could utter her very first words , she was carrying a paintbrush and donning a viridian beret. Years passed and life was good. At the age of seventeen, like many of my generation, I left home and set out for cross-country adventure. Later, with my soul still steeped in art and with vermilion paint coursing genetically through my veins, I returned East and casually pursued my calling. By the time I was twenty five, my penchant for art had become my profession. People often ask me, "Where do your ideas come from?"... "Where did you learn to paint?" I've had no formal training. Other than learning the mastery of the tools and medium by watching my family, I am essentially self-taught. My ideas come from out of the blue. Simply, the paintings paint themselves and literally take form when the brush touches the canvas; a symbiotic connection between mind and brush, my hand becoming the vehicle through which a colorful story unfolds. Often I surprise myself by the finished work and am delighted that I can bring a smile to my audience doing something I love to do. It is no mystery that my distinctive style, using texture and pattern, was gleaned from my english grandmother; a very cool lady, who was an eminent fashion and textile designer of the 30s and 40s. I have fond memories of passing my early years in her and my grandfather's studio nestled in the Catskill Mountains, watching them render their beautiful designs.. My siblings and I were given free reign of the studio and so we "played" with many mediums from printmaking, pottery, weaving and mosaics to painting in watercolors and oils. It wasn't till I began painting professionally and in quantity that, out of necessity, I discovered my present medium, house paint. The objects that you will find me painting today have broadened from the humdrum canvas to an array of found junk, castaway furniture and walls of all sizes. Over the past twenty years, between raising three children and other enlightening adventures I have produced a huge body of work. 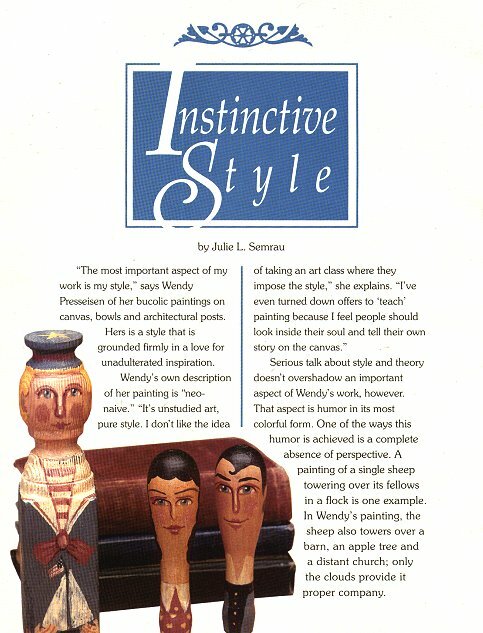 My paintings and prints have been proudly featured in many publications and catalogs including Country Living Magazine, Country Folk Art Magazine, The Museum of American Folk Art, House Beautiful, Womans Day ,Family Circle,Ethan Allen,Country Curtains, and Country Manor to name a few, as well as in galleries and shops internationally. Offered to you here, in orderable, signed prints, is but a sampling of them. So sit back and enjoy the view!